The Beantown Bloggery: I'm In StuffatNight This Week! Remember the Hot 100 issue of Stuff@Night from last month? Click (here) for a link to my disgruntled blog post after reading that issue. The magazine was supposed to feature the 100 Hottest things in Boston. Hottest restaurant, Hottest clothing store, etc. When it came time for the Hottest Blog, they chose a NYC blog. Well in addition to just writing a blog entry, I also wrote an email to Stuff@Night and it was published this week. 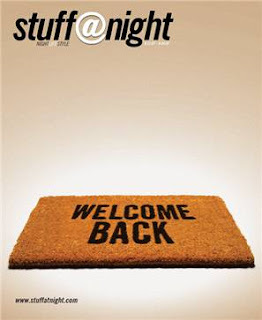 It's the issue with the Welcome Back doormat on the cover. Goto the stands and grab a copy!!!! 0 Response to "I'm In StuffatNight This Week!"